GitHub - andreasrosdal/freeciv-web: Freeciv-web repo for http://www.freecivweb.org/ production server instance. Want to be notified of new releases in andreasrosdal/freeciv-web? Pull request Compare This branch is 13 commits ahead, 3 commits behind freeciv:develop. 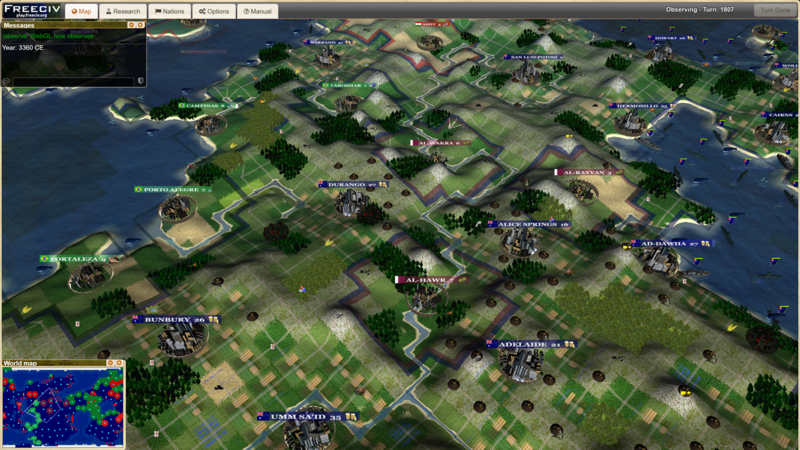 Freeciv-web is an open-source turn-based strategy game. It can be played in any HTML5 capable web-browser and features in-depth game-play and a wide variety of game modes and options. Your goal is to build cities, collect resources, organize your government, and build an army, with the ultimate goal of creating the best civilization. You can play online against other players (multiplayer) or play by yourself against the computer. 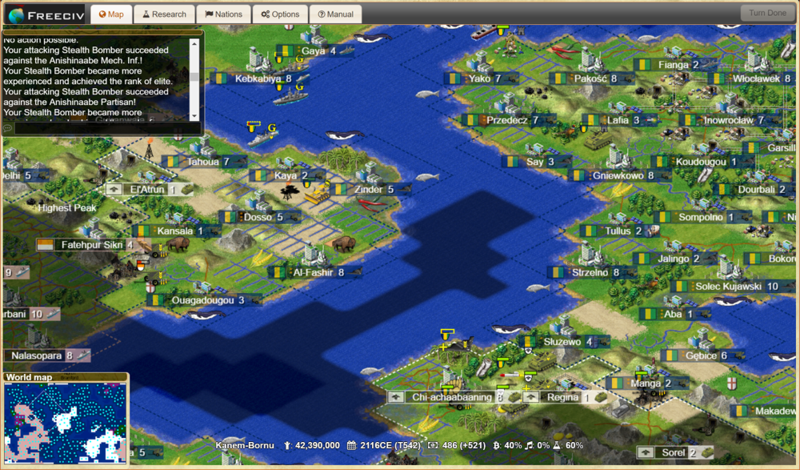 There is both a HTML5 2D version with isometric graphics and a 3D WebGL version of Freeciv-web. Freeciv-web is free and open source software. The Freeciv C server is released under the GNU General Public License, while the Freeciv-web client is released under the GNU Affero General Public License. See License for the full license document. By contributing to the Freeciv-web project, you must accept that your contibutions are also AGPL licensed. Contributions including code, graphics and rulesets are also AGPL. www.gnu.org/licenses/agpl-3.0.en.html - The GNU AGPL license document. en.wikipedia.org/wiki/Affero_General_Public_License - Wikipedia on the AGPL license. Freeciv - the Freeciv C server forked for Freeciv-web. Implemented in C with a WebSocket/JSON protocol. The recommended and probably easiest way is to use Vagrant on VirtualBox. You may also want to change some parameters before installing, although it's not needed in most cases. If you have special requirements, have a look at config.dist, copy it without the .dist extension and edit to your liking. Please keep in mind that the files are to be used in a Unix-like system (some Ubuntu version with the provided Vagrant file). Line endings for text files are different in Windows, and some editors "correct" them, making the files unusable in the VM. There's some provision to recode the main configuration files when installing, but not afterwards. If you touch shared files after installation, please use an editor that respect Unix line endings or transform them with a utility like dos2unix after saving them. Freeciv-web can be setup using Vagrant on VirtualBox to quickly create a local developer image running Freeciv-web on latest Ubuntu on your host operating system such as Windows, OSX or Linux. This is the recommended way to build Freeciv-web on your computer. Test Freeciv-web by pointing your browser to http://localhost if you run Windows or http://localhost:8080 if you run Linux or macOS. The Vagrant guest machine will mount the Freeciv-web source repository in the /vagrant directory. Note that running Freeciv-web using Vagrant requires about 4Gb of memory and 3 Gb of harddisk space. liblzma-dev - http://tukaani.org/xz/ - for XZ compressed savegames. cwebp to create .webp files of the tileset. When in a tested system, you may run scripts/install/install.sh and it will fetch and configure what's needed. All software components in Freeciv-web will log to the /logs sub-directory of the Freeciv-web installation. Freeciv-web can easily be built and run from Docker using docker-compose. Make sure you have both Docker and Docker Compose installed. Enjoy. The overall dockerfile and required changes to scripts needs some further improvements. Freeciv-web has CasperJS tests which are run by Travis CI on every commit, and by Vagrant when creating a new image. The tests can be found in tests/freeciv-web-tests.js. Please make sure that patches and commits for Freeciv-web don't break the CasperJS tests. Thanks! If you want to contibute to Freeciv-web, see the issues on GibHub and the TODO file for some tasks you can work on. Pull requests on Github is welcome!